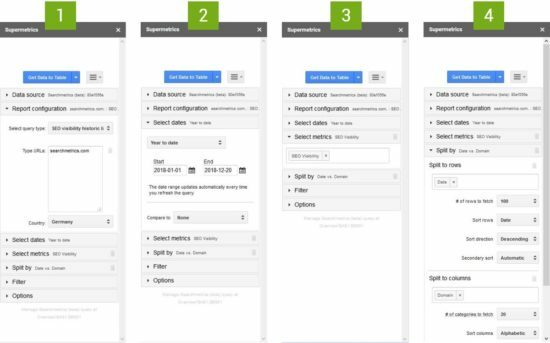 This post will demonstrate a way to bring Searchmetrics data to both Google Sheets and Google Data Studio using the Supermetrics add-on. Supermetrics and Searchmetrics don’t just have similar names – they make a great team too. 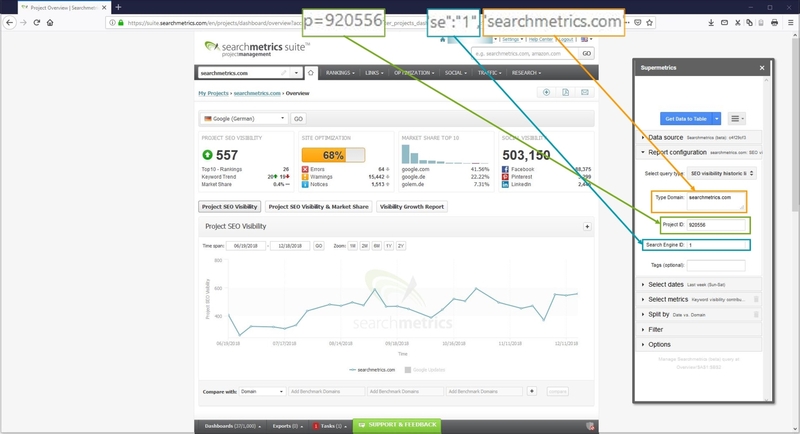 Searchmetrics provides a huge quantity of helpful search and content data. Supermetrics lets you easily report and analyze it. Why combine Searchmetrics & Supermetrics? Both companies’ founding motivation was to save time through automation. Needless to say, it’s in our interest to save you even more time by bringing these two together. 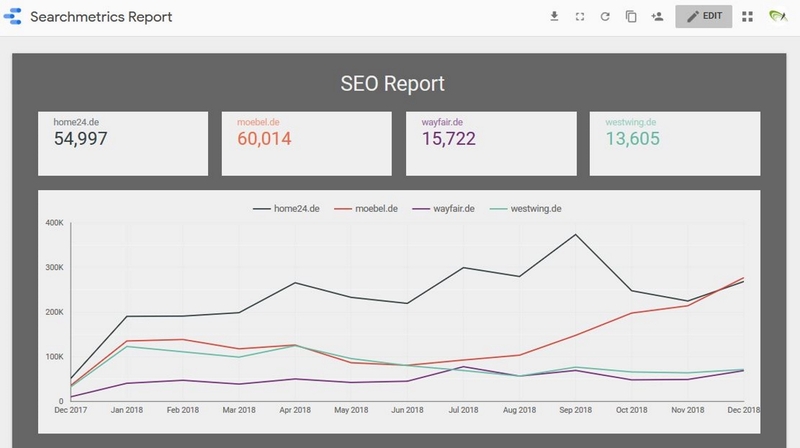 Supermetrics makes reporting and analyzing online marketing data easier, providing tools for Google Sheets, Google Data Studio and Microsoft Excel. Since their launch in 2009, they’ve managed to go from connecting Excel with Google Analytics to enabling integration with practically any tool an online marketer could possibly want or need. Check out their website! Why use Searchmetrics data outside the platform? Share reports with audiences that don’t like logging into the Searchmetrics Suite. In these situations, you turn to one of the many data visualization and spreadsheet tools on the market and create an awesome dashboard like our Senior SEO Consultant Felix did – check out his article on setting up a brand vs non-brand dashboard based on Searchmetrics data that he downloaded as a CSV file. This is easy, quick and a great way to start and visualize an ad-hoc analysis. Weekly updates = weeks of work? But what if you want to update your SEO dashboard every week? What if it includes data from 7 different sources? Assuming it takes three minutes to download and update each one of them? That’s 105 minutes every week. That’s two weeks in a year! This is when your colleague starts telling you to simply use an API and you start wondering what the hell that is. What the hell is an API? When opening a Google Sheet, click on “Add-ons” > “Get add-ons…” and search for “Supermetrics”. Click on the “+Free”-Button to install the add-on. Click “Add-ons” > “Supermetrics” > “Launch sidebar” to start using the add-on. Once you’ve successfully launched the sidebar, select Searchmetrics as your “Data Source” and add a new account. You’re now being asked to put in you API key + secret. You can find your credentials in the Searchmetrics Suite under “Settings” > “My API”. Click “create new API key” if you haven’t done so before and then copy paste both values and press “login”. Select “Report Configuration” and the query type “SEO Visibility historic list”. Type in the domains you want to analyze and the appropriate country. Select the timespan. Supermetrics gives you a couple of pre-defined date picker options. If you select one of them, it’ll automatically adjust upon refresh. Select the metric (in this case “SEO Visibility”). Define and select what should be displayed as rows and as columns. “Split to rows” > “Date” and “Split to columns” > “Domain” works best in most cases. The add-on includes selected metrics from the Research Cloud and from Project Management. When querying project data, the quickest way to get the right parameters is to copy them from the URL. Want to refresh or edit a query? Just click in the cell range containing the data and the plugin automatically detects which query you want to edit. Want to finalize the automation of your report? Select “Schedule refresh & emailing” from the hamburger menu in the top right. Ready to move on to create more advanced dashboards? Combine data in Google Sheets, display it in Google Data Studio and let us know what you think in the comments below! Lisann Kohnke is a Client Success Technical Analyst at Searchmetrics. She is our clients' contact point for all topics related to our API, and supports with the automization of analyses and efficient reporting of online marketing data.